A story in the Washington Post highlights the fact that scientists have been warning us about man-made climate change for a long time. It was 30 years ago, almost to the day, that the U.S. Senate Committee on the Environment and Public Works held hearings, convened by Sen. John H. Chafee (R-RI), on the subject of “Ozone Depletion, the Greenhouse Effect, and Climate Change.” The danger was made clear. So too was the cause: the buildup of greenhouse gases (chiefly carbon dioxide) in the atmosphere — because of us. So too was the solution: slow, and eventually halt, the rise of greenhouse gases in the atmosphere. When 1986 drew to a close, it wasn’t quite hot enough to break the record for global temperature, that was still held by 1981. But one year later, 1987 broke the record. Another year later, in 1988, it was broken again. It happened again in 1990, and 1995, 1997, 1998, 2005, 2010, 2014, and 2015. This year — 2016 — is well on its way to breaking the record yet again. If that comes to pass, it means we’ll have set a new global temperature record 11 times since those senate hearings 30 years ago. Quite apart from the month-to-month and year-to-year fluctuations, the trend in global temperature has increased by more than 0.5 °C (0.9 °F) in that time. Earth was already hotter than before the industrial revolution (referred to as pre-industrial), by nearly 0.6 °C. The 0.5+ °C we’ve increased since then brings us to more than 1 °C above pre-industrial. That has already brought trouble, including more and worse heat waves and wildfires, coastal flooding due to sea level rise, and changes in patterns of drought and flood. If we get to 1.5 °C above pre-industrial we’re in very serious trouble — and we’re on track to get there in just a few decades. If we get to 2 °C above pre-industrial, we’re headed for disaster. Rather than heed the warning as a wise nation should, certain factions of our government have actually prevented action. The senate’s Committee on the Environment and Public Works is now headed by Jim Inhofe (R-OK), who not only denies the threat, he calls it a “hoax.” Out of 15 candidates seeking the republican party’s nomination for President of the United States last summer, the only one who took the issue seriously was eliminated very early in the running. The presumptive republican nominee, Donald Trump, has flatly stated he’ll undo what little our nation has tried to do about this problem. What have we done with our 30 years’ warning? The necessary solution is clear, and has been all along: slow, and eventually halt, the increase of greenhouse gases in our atmosphere. We know their concentration is still increasing, but at what rate? Is the rate of rise at least slowing? Unfortunately, no. It’s speeding up. 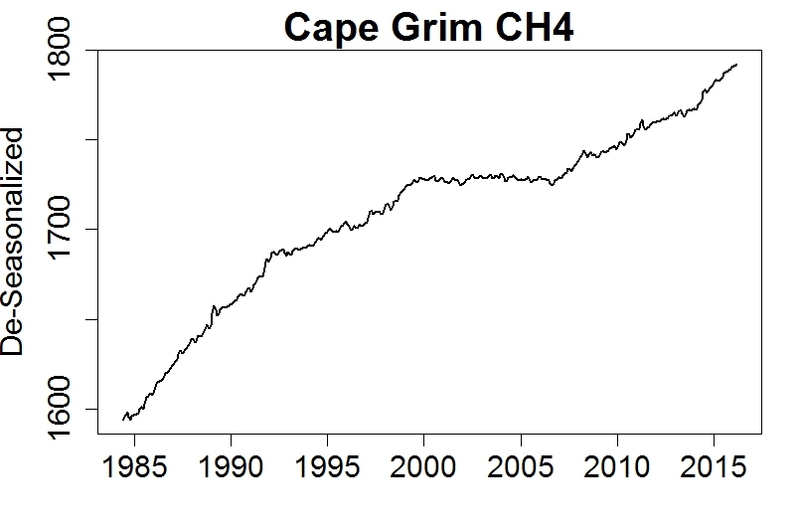 When we were warned in 1986, CO2 concentration was about 347.5 ppm (parts per million), but now it’s about 404.5 ppm. The 1986 value was already 25% higher than the pre-industrial level, today’s value is 45% higher. 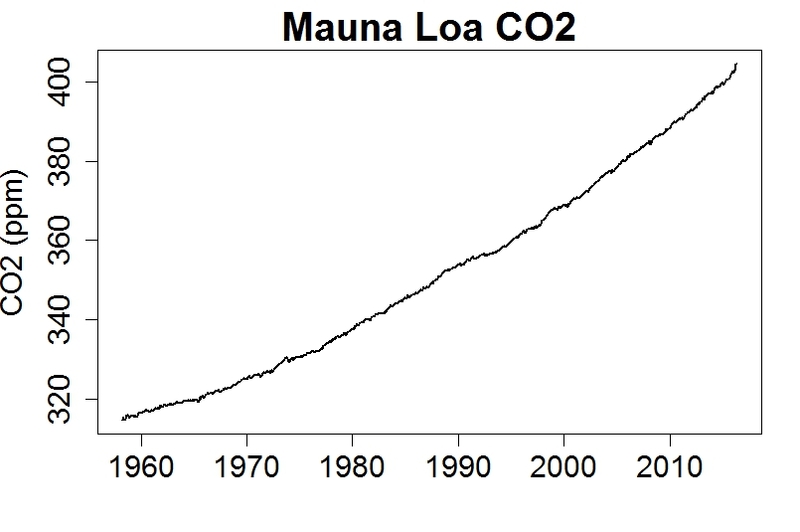 In 1960 CO2 was only going up by less than 1 ppm/year, but now it’s increasing by more than 2 ppm/year. And, alas, it shows no sign of slowing down — just going faster and faster. The conclusion is abundantly clear: that what we need to do — slow, and eventually halt, the increase of greenhouse gases — isn’t being done. The situation isn’t getting better, it’s getting worse. As dangerous as is our own dumping greenhouse gases in the air, there’s an even greater danger. We’ve already warmed the Earth substantially, and it continues to get hotter. When it does, stores of Carbon naturally locked safely away in places like the ocean and the soil can be released, to increase greenhouse gases in the atmosphere even if we stop burning fossil fuels. As the temperature of the ocean increases, its ability to dissolve CO2 decreases. Enough warming of the oceans will cause them to release some of the massive CO2 they’ve already sequestered, driving up its concentration in our air. That will make the problem of global warming worse. Perhaps the most worrisome threat is that because the Arctic is warming so much faster than the globe as a whole, the permafrost — soil that remains frozen year-round — is thawing. As it does, organic matter which is trapped within can decay, and when it does it releases CO2 into the atmosphere, except those places where instead of releasing CO2 it releases CH4. Those two great reservoirs, the oceans and the permafrost, have the potential to dump more CO2 into the atmosphere than all of mankind’s burning of fossil fuels over the centuries. If they give up their carbon, the climate impact will be devastating. Worse yet, we’ll be at a loss to stop it. So yes, I worry. We need to slow, and eventually (soon!) halt, the increase of greenhouse gases in our atmosphere. But so far, in spite of 30 years of unambiguous warning by the best scientific minds, our government here in the U.S. has done nothing but resolve to do nothing. This entry was posted in Global Warming and tagged Global Warming, Global Warming Basics. Bookmark the permalink. It’s a complicated argument, involving aquatic chemistry, but a conservative calculation shows “the seas going flat” is unlikely to occur. See the argument detailed in Section V-5 of John Harte from UC Berkeley, Consider a Cylindrical Cow, 2001. He and colleagues have written neat stuff elsewhere, too. 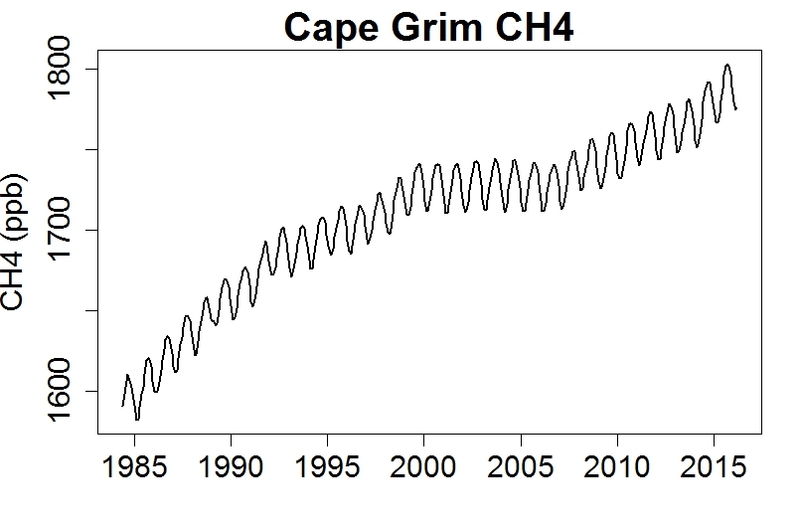 As the oceans warm, they will also push CH4 (both dissolved and clathrate) into the atmosphere. All of the carbon reservoirs must be considered as we consider (and discard) geo-engineering. We might undo the coal and oil what man has moiled out of the soil, but if we trigger massive clathrate release – that is a bigger and meaner genie to put back in the bottle. Greenland is melting (http://nsidc.org/greenland-today/ ) and sea level is rising faster. (Did you ever see icicles fall off the eaves of a house – was it gradual or was it sudden? At some point– gravity and ice fracture take over and it is sudden. Ice fractrure is discontinuous and cannot be modeled with models expressed in differential equations. When there is enough warming for ice fracture, all of the “momentum” models of ice flow fail abruptly. Sea level rise will be as linear as ice falling off the eaves of a house. Well, technically I suppose that is the ‘right direction.’ But the velocity leaves much to be desired. You are right that graph is more troubling than reassuring, as it implies completely blowing by the 1.5 C goal, and doesn’t hold all that much promise for 2 C, either. But there are at least some reasons to think that change will continue to accrue, given that the economics of renewable energy are continuing to improve, and show no imminent signs of ceasing to do so. Michael Mann stated, at the end of last year, that we’ve already reached about 1.2C above pre-industrial. The average for the first three months of this year was about 1.5C. I think we’re already at dangerous levels (James Hansen puts the dangerous limit at about 1C above pre-industrial). Although el Nino is partly responsible for reaching 1.5C, it doesn’t seem to take many years for that boosted temp to become a new baseline. I can’t see any way that 1.5C can be avoided, now. 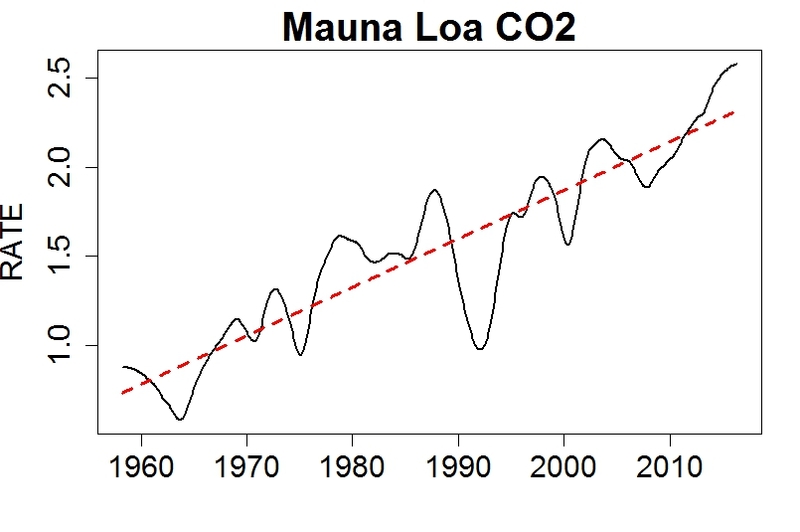 The CO2 graph from MLO looks very scary, with that clear finger sticking up right at the end. The difference with last year seems to regularly hit 4 ppm, in the daily MLO readings. I hope that declines as el Nino fades. And we are still a long way from a full doubling of CO2. So much for the pipe-dream of ECS being much less than 2.5-3C, never mind the already blown-past 1C invoked by the truly delusional. I used Excel to fit a quadratic to the Mauna Loa data and got an equation that predicts a current annual rise of around 2.23 ppm. Assuming Mauna Loa stays on that curve, that puts us at 494 ppm and rising at >3 ppm at 2050. Eyeballing the “clear finger sticking up right at the end” gives the impression that staying on the fitted curve might be optimistic. Do my numbers look right? dnem, I developed instrumentation that fits exponentials involved in natural decays in situations with high noise. (16 bit values at a million samples per second, to develop final low noise measurements at 100 Hz rates.) So I used a tool I had developed against the CO2 rates from MLO. (I don’t know where to get the hourly flask data, so I used the available monthly averages [which of course cycle up and down during a year.]) My focus was to fit the curve to the peaks that arrive in May of each year, but to use all of the annual data to help reduce noise. I got a bracket of rough values for the exponential equation in the form of B+A*EXP(T/Tau). The central value set is B=250, A=65, and Tau=800 (using approximates and not detailing the fractional digits which are meaningless.) [There is also B=240, A=75, Tau=885 and B=260, A=55, and Tau=715, too.] These Taus are in months, by the way, and the A and B factors are in ppmv. If you plug in the exact formula of 250+65*e^((698+30*12)/800), where 698 represents May of this year and the 30*12 moves us forward about 30 years from now, you get a value of about 494 ppmv. So I’m kind of surprised by just how exactly both of us hit about the same value here. So yeah. To me, your numbers look about right. Of course, one must keep in mind that all I did was to fit a single exponential to the data from 1958 forward and that none of this “understands” any real physical knowledge. If I had to suggest one reason why an exponential might fit so well (and it doesn’t fit badly), I’d postulate the human population and per capita energy usage as a thought to consider. But frankly, there are so many other influences going on I honestly don’t have a clue about why. But it does seem to fit reasonably well and it suggests that we are not only not doing what is needed to reduce the “velocity” of CO2 into the atmosphere, we aren’t even doing what is needed to reduce the “acceleration” of it. Just the opposite, it would seem from this naive approach anyway. Yep, with the reliable eyeballs, it sure looks like it kinda bends that way. Of course none of that incorporates the bump from El Nino, or the annual variation, for which you need a model not the raw numbers or the picture of how the raw numbers look. I know this is old and tiresome. But if we can’t get through to the people who do care about the problem who rely on eyeballing it, how can we convince those who don’t care, who are using the same eyeball approach to see what they believe? I know, if people keep saying they see CO2 rate of change increasing long enough, the numbers will accumulate, we’ll get past the El Nino bump, and it’ll be easier to do the arithmetic. The “clear finger sticking up right at the end” could just be due to the now waning el nino. Oh it definitely is. But it’s a bit bigger than expected due to El nino alone (by about 1 ppm) raising the specter of other feedbacks kicking it. Yep, but I don’t see a similar finger for 1998, though it’s difficult to tell from a graph. About four or five years ago (perhaps longer) I posted a back-of-envelope calculation of the rate of change of atmospheric CO&#8322 that indicated a concentration of almost exactly 800 ppm by 2100, based on the data and the assumptions made in the calculation. At the time I explicitly emphasised that the figure was predicated on “business as usual”, and I clearly remember thinking at the time that we would surely see a reduction from that trajectory by the middle of this decade. For the last few years it’s been clear that no such reduction has been remotely in evidence, and it’s this stubborn adherence to a suicidal trajectory of carbon emissions that has me ever more convinced that we’re not going to pull the rip-cord in time. Oh, I think that we should keep pulling on the cord as much as we possibly can, but we need to face the future with a clear vision of what’s coming, and all indications thus far are that it will be a fututre of pathetically insufficient mitigation, and of profoundly awful pain, suffering, death and extinctions above the natural background rates. 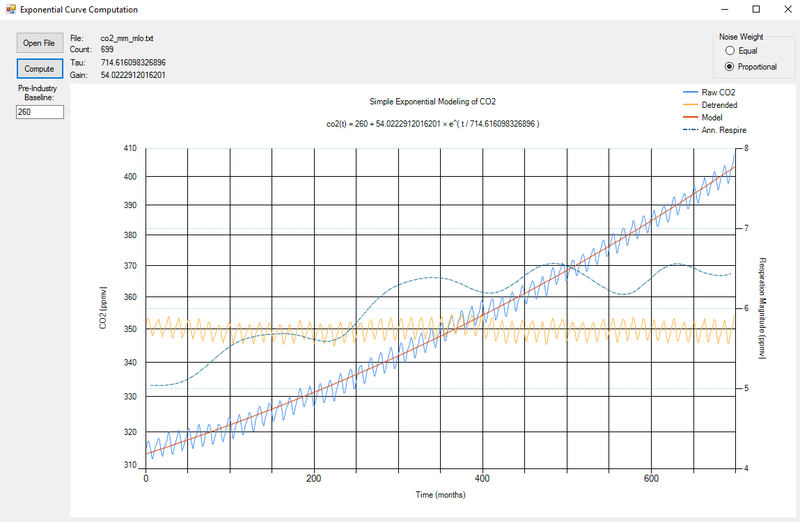 I earlier posted to dnem above with specific constants to an exponential approximation curve. So just to confirm your back of the envelope calculation, the projections based on the exponential approximation (BAU) suggests it will take 33 years to add 100ppmv, 55 years to add 200ppmv, 72 years to add 300ppmv, 85 years to add 400ppmv (>800ppmv), and 96 years (less than a century away) to add 500ppmv and reach levels above 900ppmv in the atmosphere! In short, yes. 800 ppmv by about 2100 under BAU and assuming a naively fitted curve is worth projecting so far. I suspect something will break in one direction or another before then and a new metastable local minimum will be rapidly found, even with BAU. 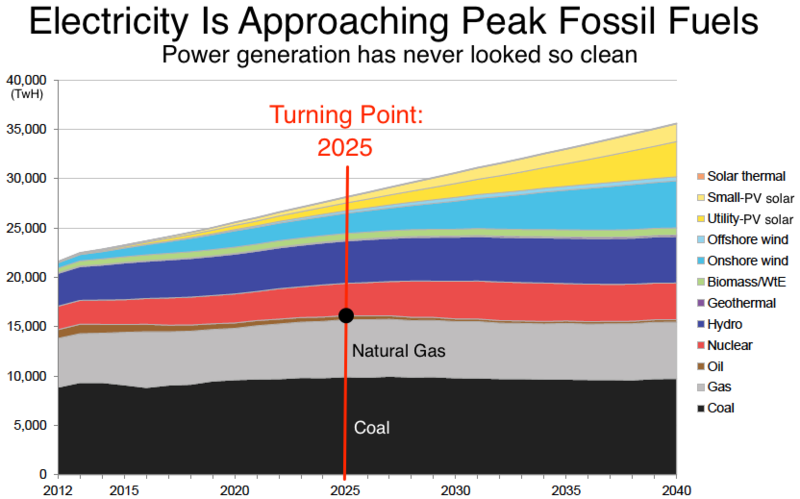 The implacable march of non-fossil fuel developments will certainly contribute, but at some point in the next few decades there will be one or more global ecosystem shifts that remove our choice to continue carbon emissions as we have. I remember some of the difficulties that Callendar had circa 1938-1940 and many arguments (mostly from deniers) about his ‘selections.’ But I also remember that Keeling, prior to the MLO setup driven forward by Wexler, had found quite consistent measurements from western US to Central America and from highly vegetative areas to high elevations in the White mountains, all of which does very strongly suggest that there exists a valid concept, as Keeling called it, of a “characteristic background concentration.” Certainly, subsequent measurements in an increasing range of sites around the world, continue to support that, too. I don’t think things were suddenly and mysteriously qualitatively different prior to Keeling’s work in the mid 1950s and setting up the MLO site. History note: Keeling wasn’t even allowed to be present when the initial MLO site was established, as Revelle refused to sign his travel orders. Instead Ben Harlin and Jack Pales did that work and had to report back their initial readings. That is certainly the question, isn’t it? I find myself thinking that we’ll slow down and decline CO2 emissions considerably, but there will be some nasty consequences as you’ve said. The question is how severe will it get, and will we need some form of SRM to deal with it. The role of red pigmented snow algae in melting Arctic glaciers has been strongly underestimated, suggests a study to be published in Nature Communications on June 22. White areas covered with snow and ice reflect sunlight; the effect is called albedo. It has been known for quite some time that red pigmented snow algae blooming on icy surfaces darken the surface which in turn leads to less albedo and a higher uptake of heat. The new study by Stefanie Lutz, postdoc at the German Research Centre for Geosciences GFZ and at the University of Leeds, shows a 13 per cent reduction of the albedo over the course of one melting season caused by red-pigmented snow algal blooms. 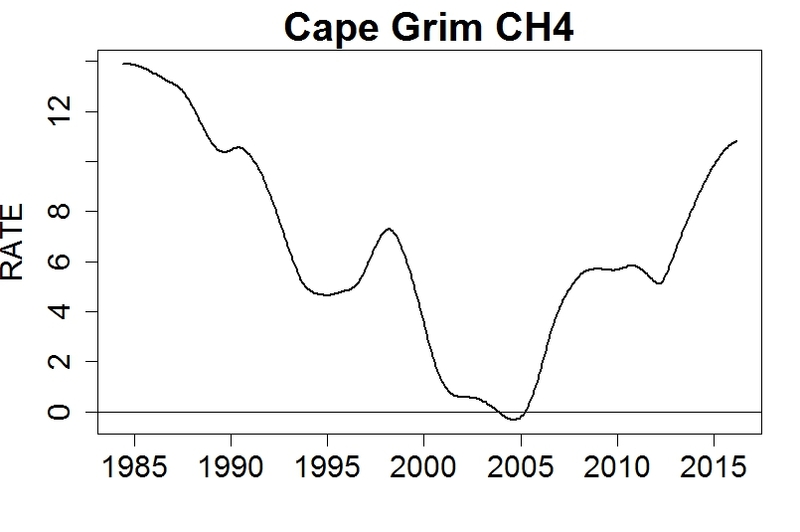 Increasing rate of CO2 accumulation in atmosphere does not have to be exponential, it could be simply slightly more steep than straight linear growth and it still gets us to the same dangerous place, it just takes longer. That is not to say that the rate of increase might not be exponential, only that the rate of increase is increasing which is clear to anyone who eyeballs the decadal numbers. It doesn’t have to be exponential. I used that as a model partly because exponentials underlie most natural processes (though multiple exponentials do not sum to another single one.) I used it partly because I was curious to see if it reasonably fit. And it does fit, to a remarkable degree. Not only does it fit well, but the best baseline value I could find (offset) turns out to be surprisingly 270 ppmv. Which is not far from a long-discussed value. It’s a coincidence, perhaps. But an interesting one all the same. If you are interested, I’d be very happy to let you play with the program I wrote to check out various constant values that apply to fitting a simple exponential with offset and you could see for yourself. The source code is short and easy, too, if you are a coder. (Plus, I’ve written a nice 8 page white paper on the technique I use to deal with S+N issues related to exponential fitting if you’d be interested in reading it [I’ll have to upload it, though, so you’d need to ask.] That paper deals with exponential fitting in the presence of noise that a typical least square fitting does not. You need to be familiar with partial derivatives, though.) The source and executable is in the tiny ZIP linked below. It reads the co2_mm_mlo.txt file that can be found at the other link also provided below. Forgive the hacked code, but I just wanted something quick and easy. We are already 1.56C above baseline now. The assumption that we won’t streak past 2C is noted. Of course we will. Very, very soon (within 10 years). We’re already committed to 3.4C and it’s quite possible (more then 50% likely) we will blast right past 4C. We know what this means too. But it’s a rare day in hell when you can get somebody to admit to it. Virtually all models were designed with assumptions and bias and fail to account for all the known variables, and virtually all models have had to be constantly updated to correct for these assumptions. Yet they’re still incapable of modeling things like cloud effect and do not keep up with real world measurements. However, we know enough today to understand what the trends mean, lag time and significance of constant warming in the atmosphere and on land and ocean. On thing scientists have learned is it is usually the lone voice in the crowd that eventually proves a new theory. What was once preposterous and rejected by the science community eventually becomes widely accepted. This is especially true with complex climate systems and our understanding. Rapid climate change is one of these claims. We know from ice cores that rapid climate change is possible in as little as one year. It is only because of our models (versus our actual measurements) do we insist that we have more time then this, but the ice samples prove otherwise. I’m pretty sure we’re not 1.56C above baseline right now, and I’m not sure where you’re getting your figures from. I come at it a little differently, but get to a similar place. There are a number of metastable states and the Earth has been in some real doozies over time. (Ice ball Earth more than once, for example.) There are lots of minor state transitions as well as major ones. I just think of it as a “surface” pockmarked with divets, bumbs, ridges, and so on, and where this surface itself is affected by what is riding on it and is going on. So the surface ALSO evolves over time, along with the system parameters. Models generally don’t capture the ability of the systems to move rapidly from one metastable state to another. Yet it happens. So this is an area where I think things are remarkably weak and yet which are very important for understanding the system of ice, earth, air, water, sun, and life here. So far as I’m aware (and I don’t have anything close to a comprehensive view), climate scientists have not yet attempted to apply catastrophe theory. To apply it, they would have to bring in dynamical considerations to elementary static catastrophe theory by incorporating time derivatives. I’d imagine that the physical system states would be governed by a potential (or surface), V(x;c), and that they’d search for, in part, a point x (an element of the field R^n), which minimizes that potential. They’d have to keep in mind that changing external conditions change the values of the control parameters (c); and that changing c, in turn, changes the shape of the potential V(x;c). As the shape of the potential changes, the original global minimum in which the system state sits may become a metastable local minimum (because some faraway minimum assumes a lower value), or it may even disappear. Such a system state may also ‘jump’ from one local minimum to another. Trying to decide when and to which minimum the jump occurs would might be addressed by the Delay and Maxwell Conventions, or other creative ideas I suppose. But perhaps a lot more needs to be understood before any of this would really help. I keep wondering if some imaginative climate scientist will see a way to bring in a dynamic version of catastrophe theory in order to study local points of stability and the changes in the shape of the potential that can lead to rapid changes of a system into new local points. And I shall keep my eyes out for such a paper. Right now, I don’t think there is any of this in the modeling and I’m pretty certain they really do exist in our actual planetary system. It’s not all some nice, gradual system with local and global negative feedbacks to keep it all nicely linear and stable. It does make transitions. Some of them quite suddenly. And they need to be captured in the models. If the models can’t exhibit that behavior, then they are missing something important. describes a startlingly rapid extinction process and large scale fish death that would fit with a canfield ocean event. ?? Nor would the sedimentary evidence discussed prove *global*, as opposed to local, scale. OT Alert. I got a call today from Tom Wakely, who is challenging Rep. Lamar Smith. You could have knocked me over with a feather. I asked him if he had a chance (of course he was bound to say yes) and he said there had been a redistricting that changed things. No doubt anyone interested would prefer I could be more specific but I was so pleased to hear from him I didn’t ask. However, if anyone wants to support him, please pass it on. His donation page includes a video from Bill Nye; below is his main site. Not much there, but I did find some noise about him on DailyKos. Looks like he’s hooked up with the progressive side of Dems, Bernie-ish. I’m ambivalent about that, having run into trouble with some of Bernie’s more single-minded supporters. But it’s a chance. 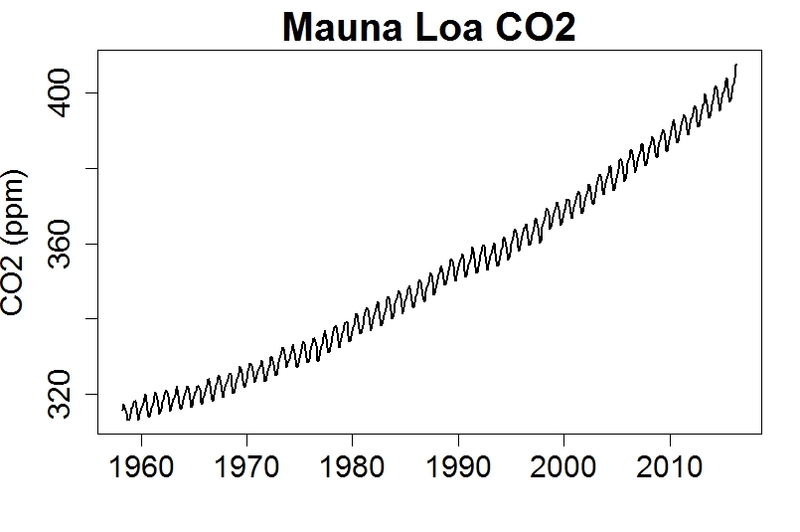 I suddenly became curious about annual CO2 respiration rates on Earth, thinking more, and wondered if the monthly MLO data from 1958 on might provide a rough idea about this. Again, I had no idea what would result. The approach I took is the equivalent of a “quadrature or vectored lock-in amplifier” method. I used this, because I don’t know the phase and don’t want to care about it. It does increase the noise (doubles the noise band), but that’s acceptable for a qualitative question. This method uses sine() and cosine() using a known frequency (in this case, of course, I used “one year” as the frequency of choice) and generates a 0-degree (cosine) and 90-degree (sine) summation. The rms output is then just the square root of the sums of the squares of the two orthogonal phases. it was my hope this would zero-in on the RMS amplitudes. There was a small problem in that there is an underlying “trend” to the data, where the start and tail end of one year’s cycle don’t start and end at the same place, so I de-trended the data before applying the lock-in. The results are kind of interesting and a bit unexpected. The magnitudes look good, though. So at least that much worked out. What is interesting is that the respiration rate appears to have stayed at about a mean value of 1.3 ppmv rms to about 1974-1975, then it shifts to a mean of about 1.45 ppmv rms and stays there (with wider swings occurring more recently, but the average appears to have remained) and then, just in the last year, it moves upwards. It’s too early to know if that will be a new plateau or if it’s just a still wider swing. But interesting. I’d say the result does seem to suggest that there may be some increase in respiration rates. But it is noisy. If anyone is interested in the methods or the resulting data or charts, I’d be happy to provide it. The image is interesting. It includes the monthly MLO data proceeding from march 1958 to may 2016 on one curve. A second curve is the fitted exponential. A third curve is the detrended data (MLO minus curve.) It is this third curve that will be nice and flat if the curve models the trend well. (And it does for a small range of pre-industrial levels — but please try that out on your own.) This 3rd curve is set on the line for 350 ppmv as an arbitrary location (the data is really centered on 0, but log charts don’t like that.) And a fourth and final curve provides the annual respiration rate. This last curve is developed by first using a narrow band FIR filter (more than 100 taps) on the detrended residuals to exclude everything except the 1-year averages and leave only the annual amplitudes of CO2. I then process this data to capture only the peak-to-peak values. There are two of these per year (inhale, exhale.) These are then plotted along with the rest of the data, but using a separate y-axis guide and dot-dashing to separate this last curve, visually. Just as I hadn’t known what to expect for the simple exponential model, I also had no real clue what this respiration curve would show. I had expected some slightly increasing value, I suppose. So perhaps a slightly sloped line (from earlier eye-balling of the detrended data.) But I really hadn’t at all expected to see the nice 11 1/2 to 12-year oscillations in the data. It’s possible that this is related to the solar sunspot cycle. Or it might be some artifact of my methodology, too. Or just about anything else. But it is interesting that it appears to be consistent. There is also a gradual rise in the respiration rate, it seems. If nothing else, it’s fun. So now I wish I knew an appropriate climate scientist well enough to ask about these questions. Are the oscillations that seem evident in the respiration curve real and related to some existing natural process or just artifacts of my method? I believe I have eliminated such longer term effects through appropriate anti-aliasing. But I don’t know and I certainly need to spend a lot more time thinking about my own methodology to see if I can identify some culprit there. But I’d be interested in other areas in the literature to go look at, too. Maybe this one will show up in next year’s BAMS special issue. Add that with the storms that occurred in China, the lightning strikes all over Western Europe and India, and increasing dust storms and we have quite the shin-dig going on.